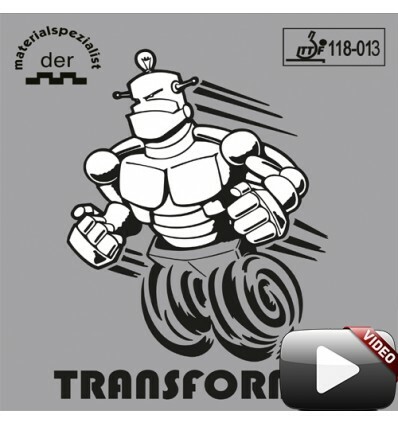 With TRANSFORMER der-materialspezialist has created a slick antispin rubber with an extremely high disruptive effect in combination with a new dampening sponge. The combination of extremely slick surface, long inverted pimples and the extreme speed absorbing sponge make TRANSFORMER globally unique. TRANSFORMER generates a maximum of spinreversal and disruptional effect whilst maintaining perfect control and offensive capabilities at and from the table. For the new used absorption sponge the thickest version (1.5mm) is the slowest. Glue this rubber only with adhesive foil as described in the attached mounting instruction. In addition to the perfect use with celluloid balls, all of our smooth ANTI TOP rubbers also produce maximum spin reversal and a very high disruptive effect with the new plastic and ABS balls.